In February of this year, Facebook launched some new page features, one of which is a powerful tool for increasing your company’s visibility within the Facebook community. It’s called the “Use Facebook as Page” feature. Cindy Ratzlaff writes in Business Insider that the new feature allows page administrators to post throughout Facebook—on other pages and on profiles—as the company brand. “This means that if a brand could potentially comment on the Facebook page of a popular television show with millions of fans and gain visibility with those fans. With the new feature, your brand image appears with comments on other's wallls. The feature solves the perennial problem of small business owners who want to harness the potential of Facebook to market their business, yet retain their personal profiles for networking with close friends and family. Now users can simply toggle between using Facebook as their page, or as their personal profile. Other advantages of the new feature is the ability to see page notifications, “like” other pages as your brand, and view a stream of other pages your company likes. 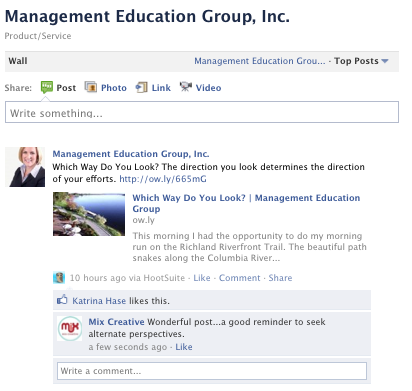 If you haven’t already, be sure to take advantage of this new feature when promoting your business on Facebook! This entry was posted on Thursday, August 18th, 2011 at 8:34 am and is filed under Marketing your Business. You can follow any responses to this entry through the RSS 2.0 feed. You can leave a response, or trackback from your own site.